When I was completing the coursework for my doctorate, I read an article that will always stick with me. It was on “useless suffering.” The brilliant author wrote about how the human mind naturally makes meaning out of distress and suffering so that profound but momentary sadness or distress can be coded as meaningful or useful. This process usually prevents negative feelings from overwhelming us and shutting down needed thinking processes. Some events, however, are so horrific that the mind cannot and should not seek to find meaning in them. I completely agree with the author that in this fallen world most tragedies are senseless, and that we do God and ourselves a disservice when we seek to find meaning in abject suffering. Unlike the article’s author, however, I believe that, though the suffering from a tragic event need not be meaningful in itself, no suffering is fruitless or useless if God teaches us and brings us closer through the process. The Scripture passages from this week all speak to the inability of suffering to snuff out the good work that God is doing in and through God’s people. Although I believe that God disciplines us to produce fruit, I do not believe that all or even most difficulties in our lives come from God. Scripture is clear, though, that Jesus, Paul, the disciples and the early church all faced their share of trouble, sadness, isolation, persecution and trials. There is enough suffering that we need not seek it out or wallow in it. But faithfulness to God through a period of suffering does lead to blessings. The passage from Isaiah speaks of an abused prophet. The speaker knows how to speak words that comfort the weary (Isaiah 50:4), yet these words don’t seem to please everyone. He is abused and beaten, and his beard is pulled out (Isaiah 50:6). He resists none of this. But God doesn’t leave him to face this violence alone. God is the help of the prophet. Even in his suffering, the prophet knows that God prevents him from being disgraced (Isaiah 50:7). He is so certain of God’s attention and intimacy through his own suffering that he challenges his abusers, asking, “Who will contend with me? … Who are my adversaries?” (Isaiah 50:8). The suffering has heightened the prophet’s reliance on and trust in God. Jesus came so that we may have life and have it abundantly (John 10:10). In Philippians, Paul describes Jesus as having forsaken equality with God and abased himself by taking on the form of a human servant. Jesus became obedient to death, even a horrific death by crucifixion. And then Paul uses a wonderful word: διὸ (“therefore”). Specifically because of Jesus’ obedience through terrible suffering, God highly exulted him. Jesus was faithful to what God had called him to and did not give up. For that reason, Jesus was given the name above all names. But faithfulness in suffering did not just lead to blessings for Jesus alone. Even before his torture and execution, Jesus spoke to his disciples about the rewards that would come though faithfulness despite suffering. After instituting the eucharist, Jesus assures his disciples: “You are those who have stood by me in my trials; and I confer on you, just as my Father has conferred on me, a kingdom, so that you may eat and drink at my table in my kingdom” (Luke 22:28-30a). Just as God rewarded Jesus for his faithful obedience through suffering, so will Jesus reward us if we stand by him through our trials. As we celebrate Holy Week, it’s easy to focus only on the suffering of Jesus and forget our neighbors who may be suffering around us. Jesus came so that we may have life and have it abundantly (John 10:10). I’m absolutely convinced that God does not bring useless suffering. Further, it is our job, as citizens of the kingdom of heaven, to relieve suffering where possible. But when we suffer, as we all do at times, we can seek to emulate the example of Jesus and his disciples to be faithful to God through the trials. We will be blessed. 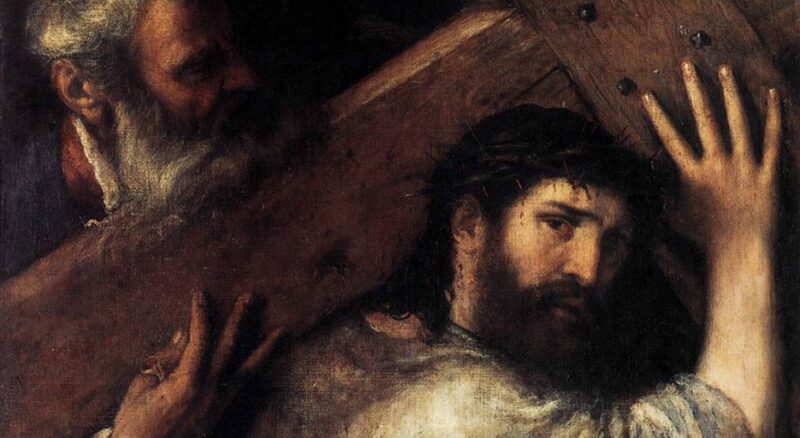 This Holy Week, as we pass through the shadow of death into the marvelous light of life, I will be thinking about Jesus’ faithfulness to God’s salvific mission, even to the point of death. It is the power of Christ working in the lives of all the redeemed that allows us and calls us to be faithful to God, especially through suffering.